Spring 2015, there could be a crisis on its way. I home from work to find out my next door neighbour installed two solar panels on his roof. A ‘DIY plug and play’ type which you only need to plug in the wall. Well, you probably know that solar panel installations are a nightmare for radioamateurs, so my heartbeat went up to 200 beats per minute when I saw the installation. I immediately turned on the radio to listen if my so beloved hobby had come to an end. No… nothing to hear, on all amateur HF bands and 6 m, no new interference at all. Wow, I must be a lucky guy. This installation is good! About a month later, I am totally ready to do some DX’ing on 10 m band. I turned the Moxon to the east, switched on my radio and there it was. As if the devil had taken control of the frequencies. QRM levels at S9+10dB on 10 m. I quickly switched to the groundplane antenna to find out that 40 m and 20 m were covered by S9 noise. Oh no, what about 6 m? I switched to the 6 m delta loop but even VHF was covered with noise up to S9. Where the heck did this noise come from? Could it be the neighbour’s solar panel? No, because he installed it a month ago and did not notice any increase in noise. It must be something else. Or… wait…huh? It’s nearly gone when the sun sets… Oh no, must be those solar panels after all..
Next step was to confirm that the solar panel installation was indeed the source of the massive interference. 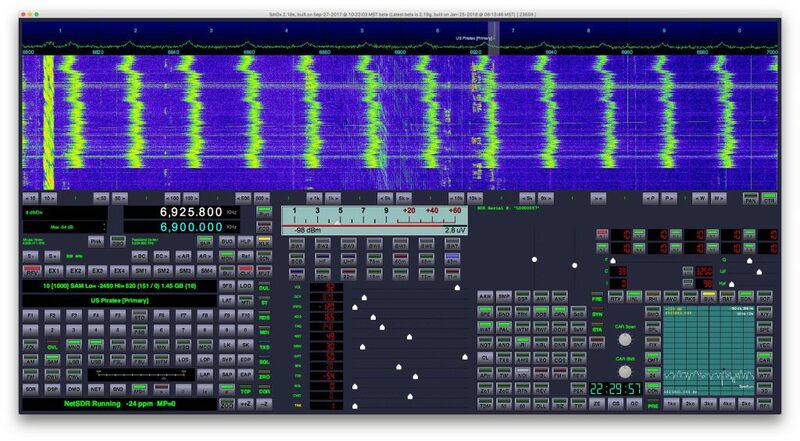 One very easy way to locate the source of this interference is with a classic AM medium wave portable radio. Most of these have a coil (ferrite rod) antenna which is sensitive to directions. But I was unable to locate the source. It seemed to come from every possible direction. So next step was to ask my neigbour if I could cover his solar panels and see if the noise would decrease. “No problem” he told me, and we covered the panels with a dark plastic sheet. I ran down to the shack, but the noise was still present. OK, I did not expect that. I was convinced it were the solar panels. The fact that the noise was gone in the dark, made is very suspicious. Only one way to take on this problem, contact communication authorities to file an official complaint. Few weeks after I filed a complaint, the communication authorities (Agentschap Telecom, or short “AT”) contacted me and set a date to come over and do the necessary research. About six weeks later an inspector from AT drove through the street several times. He parked the car with all equipment and rang the doorbell. OK, I know this guy, he is also a HAM. We sat down and discussed the noise problem. His first findings were that there were several QRM sources in the street, with one peaking on amateur bands, especially 40 m. It was a plc (power line adapter for internet) across the street. We ask that neighbor if he could pull the plug, and QRM went down a little, but still at S9. The inspector than pulled a hand device to locate other sources and within 15 minutes the neighbour’s solar panels were isolated as the main source of the noise. Now, see if this neighbour would cooperate in shutting down the installation. So we rang his doorbell and asked him to un plug the panels. He was willing to cooperate and after he pulled the plug, the QRM was gone and the band was silent… The inspector also told me that covering the panels from sunlight for a minute isn’t going to work. Then the inverters start to pulsate until and only after much longer, the installation will shut itself down. I asked the inspector what my options were. Well, he could not do anything more that day, but he promised to contact me which next steps to take. A weeks later the inspector emailed that an option was to measure QRM at the solar panel installation itself. But he stated that he needed to measure at the plug and could only measure on the AC side. There was a good chance that the QRM originated from the DC side, for which AT did not have a measuring procedure yet. But, I also wondered if my neighbour would allow the inspector to enter his property. I guessed that if he smelled trouble, he would not allow to do any measurements at all. This turned out to be a very delicate situation. I have a good relationship with my neighbour. He is a friendly guy and I know he never complained about the stack of antennas that cover my roof, for which I also don’t have the necessary permits. If AT concludes that the solar panels produce more RF than the standard dictates, my neighbour would have to turn off his installation which obviously will cost him electricity. He would need to alter the installation, perhaps even install other inverters, costing him money. Worst case would be that the installation could not be altered at all and he would have to start a legal fight with the supplier or manufacturer. He is not technically gifted so difficult for him to understand why this all needs to happen. With this in mind I decided to let it rest for a while. Solar activity was already going down to a new minimum, so there wasn’t an urgent need to use the higher HF bands. Also my wife’s health deteriorated when in 2016 she was struck by two strokes. So I had to take care of my wife and kids and in the mean time work five days per week in a very busy job next to being a board member at VERON HQ. So there was hardly any time to spend on amateur radio. We are in 2018 now, in the mean time I quit as board member of the VERON HQ (I was in charge of IT and Public Relations). My wife got back on her feet, my kids got older and were able to take more care of themselves, so I got spare time to spend on the hobby and got back on HF. First, I disassembled the Moxon and extended the vertical (so it would cover more of the lower HF bands) and put at the highest point on the roof. Oh yes, and the neighbour added two extra solar panels, so I expected even more QRM. But strangely enough it did not produce more QRM. On the contrary, QRM levels even dropped on HF bands from 80 m to 30 m to what could be considered as more or less acceptable levels. On 10 m however it’s still S9 and on 20 m around S7-S8. But I am mostly active on 80 m, 60 m and 40 m band in FT8. That wouldn’t bother me, until conditions on higher bands will improve. A year later, it seems that we are close to enter a new solar cycle. In a few years the higher HF bands, with my beloved 10 m band, will open up again. So in the next year, somehow, I needed to tackle this QRM. What am I going to do about the solar panels? I could contact AT again and ask them to do a second measurement. They improved their measuring procedures for solar panels for which they no longer need to enter the neighbour’s premises. This really put me in a difficult situation, because if AT would force him to shout down his solar panels, I would have seen the last of my friendly neigbours. They could demand to take down my 13 m vertical, which stands 21 m tall from street level without the necessary permit. By coincidence I found a video on Facebook shared by a Swiss amateur who I know for quite some years. He demonstrated a QRM eliminator. A device that uses phase shifting to cancel noise. I always thought that it had hardly any effect, but the result in this video really surprised me. I definitely needed one. There are two types commercially available, the MFJ-1026 by MFJ Enterprises and QRM Eliminator by WiMo in Germany. There is also a kit available so I could built it myself. But due to an accident I miss one finger my right hand so soldering a UHF plug is already a battle. So I took a look at eBay if any second hand is available. To my surprise there are several amateurs that built this device, which looks as good as a commercial one, but for half the price. So I bought one from US4LG Igor. Why I choose this one and if it worked for me, you can find out in this blog post where I am reviewing it. This entry was posted in Interference by Jean-Paul Suijs - PA9X. Bookmark the permalink.